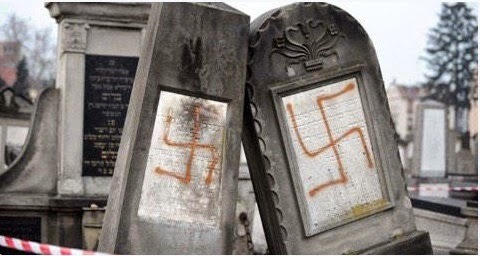 PARIS (AP) — Hundreds of graves have been vandalized at a Jewish cemetery in eastern France, in what the president called an “odious and barbaric” anti-Semitic act against French values. The vandalism comes at a time of growing insecurity among French Jews and amid general religious tensions in Europe, after Islamic radicals attacked a kosher market and a satirical newspaper in Paris last month and similar attacks hit Denmark this weekend. French Interior Minister Bernard Cazeneuve said in a statement Sunday that a criminal investigation team is at the damaged cemetery in Sarre-Union, near the German border, and authorities will do “everything” to pursue the vandals. Jewish and Muslim gravesites and places of worship in France see sporadic but frequent vandalism. The incident this weekend was of an unusually large scale, and hit a cemetery that has been vandalized in the past. Local media reported that about 200 grave stones were knocked down, and a monument to Holocaust victims was damaged.